If your Atlas Copco compressor has a compatible Elektronikon® monitoring system, this app allows you to review various compressor parameters and receive various status notifications on an iPhone or iPad. Set up your system by connecting your compressors to a WiFi router and connect your iPhone or iPad to this network. This app does not display every function/feature/configuration of the Elektronikon® monitoring system. 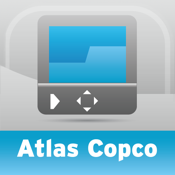 Atlas Copco hopes you will find this app to be useful. Disclaimer: Atlas Copco does not warrant or make any representation regarding the availability of the service, the correctness of the data, the connectivity to the service and/or that the application is compatible with any software or hardware.